Baked Egg And Saffron Halwa recipe by Nazia Nazar at DesiRecipes.com. Heat 2 cups of milk with the sugar till the sugar is dissolved. Blend the remaining 1 cup milk with the almonds to form a paste. 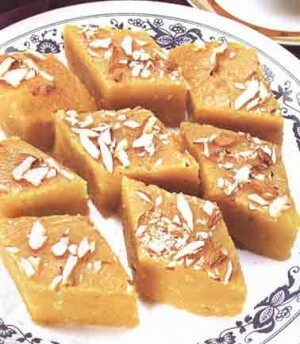 Mix the almond paste with eggs, milk, butter,milk powder and saffron. Stir in the yellow food colour. Pour the mixture into a baking tray and sprinkle almonds and pistahios on top. Bake on mark no.4/350 degrees F./180 degrees C. for 45 minutes or till it is golden brown. Let the halwa cool and later cut into diamond shape.